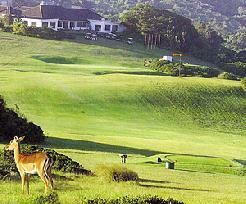 Fish River Golf Course is situated near Port Alfred in the Eastern Cape, South Africa. With delightful views of the Indian Ocean from several of its holes, the Fish River Sun Country Club offers golfers a parkland type challenge along the beautiful and unspoiled East Cape coast. At 6 300 meters this Gary Player designed course is no push-over. High vegetated dunes and thick coastal bush flank the fairways and if this were not challenge enough - the Old Women's River must also be negotiated. An essential aspect contributing to the enjoyment of any golf experience is the condition of the course and here again you will find the course is beautifully kept. In designing the course Gary Player went to extraordinary lengths to ensure that the outstanding natural features of the area were not compromised. 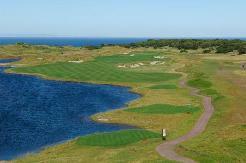 The course therefore takes the golfer on a seaside ramble that is most rewarding no matter what the golf is like. This is a Parklands Course and not a Links, but when the wind blows, it offers a great challenge to all handicaps. Signature Hole: The river comes into play rather dramatically at the 12th hole, a long par 5 that winds its way along the riverbank. In addition the river must be crossed twice, both times requiring good solid shots to make it across.